Navel piercings were very popular during the nineties – a decade characterized by the rise of multiculturalism and alternative media, grunge, the rave scene and hip-hop waves spread around the world. A perfect time to express yourself loud and proud where body piercing finds its perfect niche. Navel rings are irreverent—an insouciant, universal symbol for “whatever,” exhibited by your body. Even though they are called ” belly button piercings,” the belly button isn’t pierced; the jewelry just sits over it. 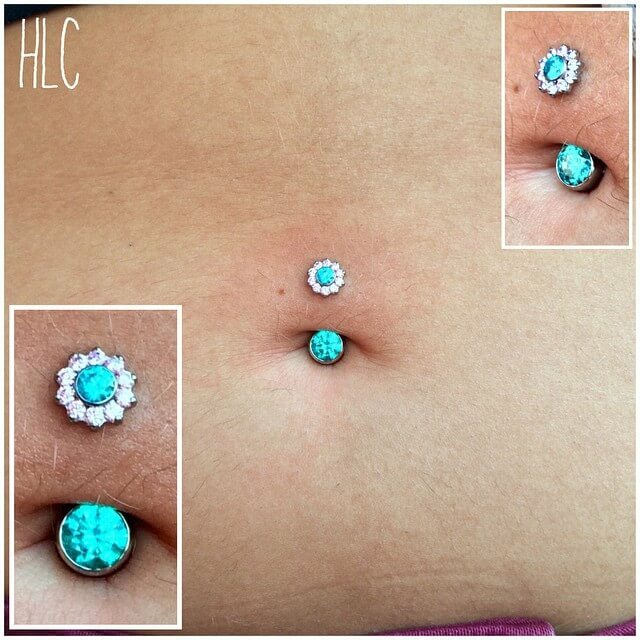 The piercing typically goes from above the top rim of the belly button down and out into the belly button cavity. The same can be done at any point around the belly button rim. Belly button rings are pierced through the top of the navel, with one end of the bar sitting inside the navel. As with any piercing, the belly button piercing needs to be properly cleaned. It should be cleaned at least twice daily with saline solution. We highly recommend avoiding swimming and submersion in water until it is healed. Also, we recommend regular cleaning for at least four months. Belly button piercing healing time varies from 12 to 18 weeks. An inverse navel piercing is pierced through the lower ridge of the belly button, rather than at the top. This piercing works best when the person’s anatomy presents a prominent ‘lip’ on the bottom edge of the navel. Belly bars (banana bells), large BCRs and circular barbells can be worn in inverse navel piercings. Regular cleaning for at least five months is optimal. This piercing should be cleaned at least twice daily with saline solution. Swimming and submersion in water are not convenient until it is completely healed. Inverse Navel piercing healing time goes from 12 to 18 weeks. Remember that piercings should only & experienced body piercer, and here at Mantra Tattoo, we have two of them: Claire & Lil’ Chris! 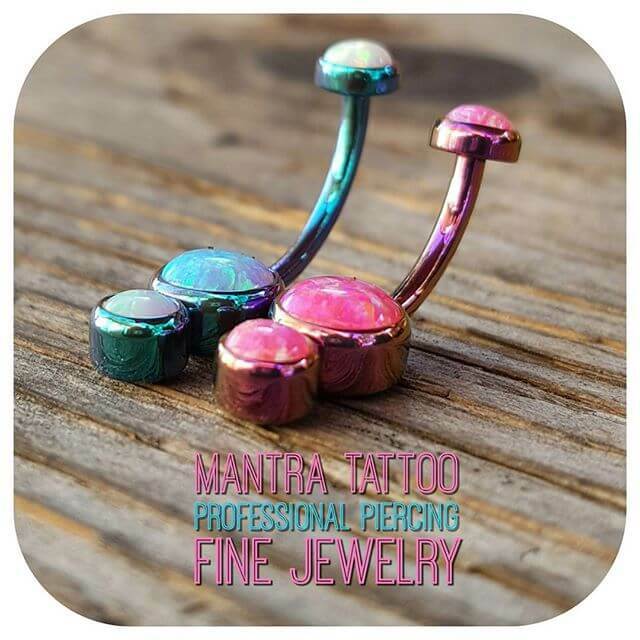 At Mantra Tattoo, we have a wide range of belly button jewelry that includes everything you need to keep your belly button piercing looking and feeling great. The most popular piece of belly piercing jewelry are belly button bars, but we also have a gorgeous choice of belly button dangles, belly rings, and fake belly button jewelry to complete your look. Mantra Tattoo is Colorado’s best premiere full-service tattoo shop providing professional clean custom tattoos, piercings, and a large variety of high-quality jewelry and clothing. Visit us to get your custom tattoo designed by one of our experienced tattoo artists, or come by to pick up a beautiful piece of body jewelry and get pierced by one of our professional body piercers.